The children of Western Ghana's House of Israel community are the first generation of modern Ghanians to be raised Jewish. Yet, members of this community believe that their Sefwi ancestors descended from Jewish traders who came through Timbuktu. The current community was born 25 years ago, after a local spiritual leader had a "vision" that convinced him that his Sefwi ancestors were actually Jews. Since the community's foundation, the elders have grown their group to encompass several large families. Most members of the Ghanian community live in Sefwi Wiawso, a small city in the country's southwestern corner, near the Ivory Coast border. Sefwi Wiawso has one main street, a dirt road that runs along the top of a ridge overlooking the region's green hills. Small shops line either side of the main strip, including a general goods store owned by community member Kofi Kwateng and a photography operation, "Vote for God Photos," run by community leader David Ahenkorah. Other community members live in a small farming village called Sefwi Sui, located approximately twenty miles from Wiawso. Every night the House of Israel community gathers at the house of Brother Isaiah to study Judaism from books Western donors have sent. "Rabbi" Alex reads the passages in English and David Ahenkorah explains each passage to the men, women and children who sit before him. They study hard because they know they have much to learn. Jay Sand visited the House of Israel congregation of Sefwi Wiawso, Ghana, in November 1999, and Bryan Schwartz visited the community in December 2003. They will present its members in vivid text and photographs in Scattered Among the Nations. 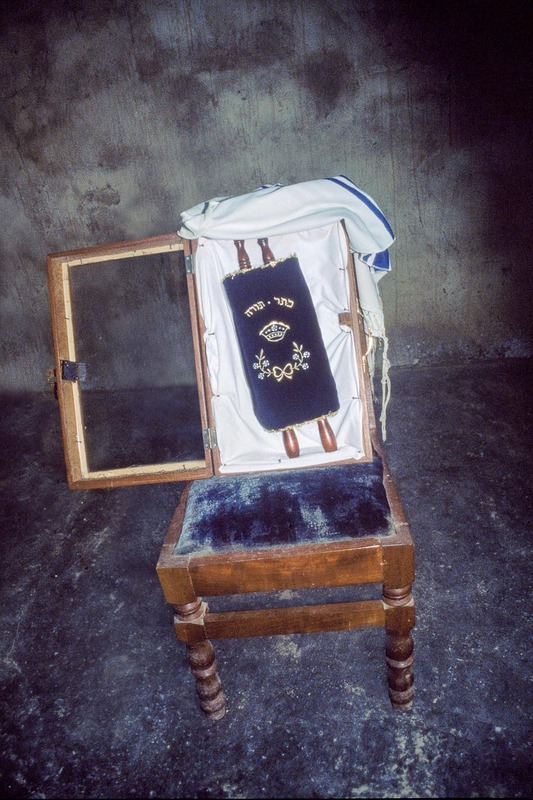 The House of Israel community’s miniature Torah is housed in Tefereth Israel synagogue in a glass and wooden case, which rests on the seat of a chair and is typically covered with a tallit. The Torah, carried to the community by Washington, DC-area resident Daniel Baiden, is removed from the ark every Shabbat morning. Though it is tiny, the community loves this Torah. At Shalom Enterprises, owned by a local Jewish businessman, children play with dreidels and stickers they received as gifts from a foreign visitor. David Ahenkorah looks up from praying the afternoon service in the sweltering heat in Tefereth Israel, the lone synagogue of the House of Israel community in New Adiembra, Sefwi Wiawso, Ghana, in West Africa. He practically lives in the synagogue on Shabbat, when he leads services for the entire community, walking home only for meals. The heir to the vision of House of Israel’s founder, David is a Jewish missionary in his own right. “Very soon, New Adiembra will not be the only community,” he explains, mentioning two other villages in Ghana’s Western Region where he is already teaching Jewish traditions. After helping to prepare the Shabbat meal, Kwame Armah leans out the window of his family’s kitchen and cleans his hands before nightfall. Children comprise many of the hundred or so members of Ghana’s House of Israel community. Unlike their parents, most of whom chose Judaism as their religion while they were adults, the children of the community have grown up with Shabbat, nightly meetings to learn about Judaism, and a strong connection with the Jewish people. Shortly before sunset on Friday, Frederick Edu pounds repeatedly as Florence deftly rotates the white starchy putty inside the cassava root, using the traditional wooden pole and carved wooden block. Through this process, they will make enough fufu—Ghana’s staple food—to last the family for Shabbat.